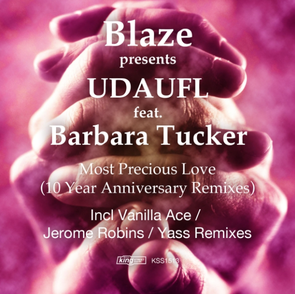 King Street Sounds brings you five hot remixes of the iconic anthem ‘Most Precious Love’ from Blaze presents UDAUFL feat. Barbara Tucker! Kicking things off, London based indie-dance artist Vanilla Ace reworks the original into a big peak time track. Toronto based tech house artist Jerome Robins gets down to funk with his fresh re-rub of the original and German duo Roter & Lewis take the vibe deep and bumping with their forward thinking dub mix. Finally, King Street favourite Yass delivers both dub and strip down remixes that should both well on the floor.